The Orange Alpine 6 is the de-facto big mountain leveller. Engineered to perform in the roughest mountain terrain. 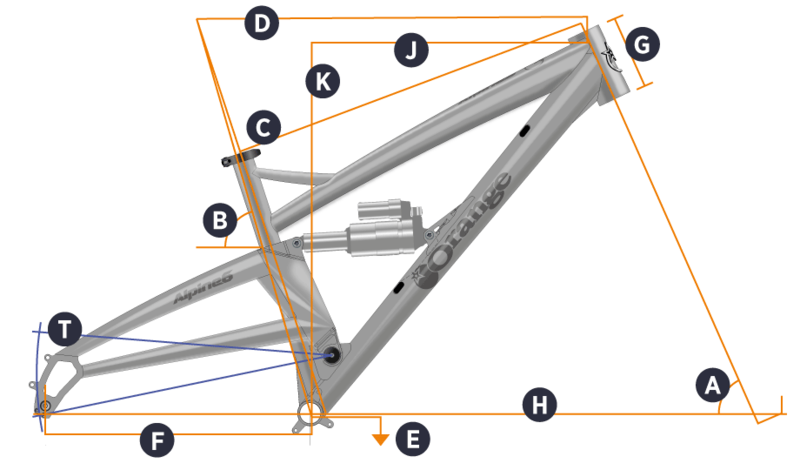 The Orange Alpine 6 geometry is designed around 170mm front/160mm rear travel. With its slacker 64.5° head angle matched to the 170mm fork we get that alpine handling feel we all love; confident, unflappable and most importantly, fun. With neat finishing touches like internal cable routing, every element of the frame’s construction has been analysed and optimised, to the point that, size for size, the Orange Alpine 6 frame is significantly lighter and stronger than its predecessors. One of our most popular models and it's easy to see why. Whether in the heat of competition, or simply being ridden for laughs, the Orange Alpine 6 has that spirit we love in a bike, the ability to surge through the rough stuff and rewards the rider that pushes hard. Sunset Cycles offers the 2019 Orange Alpine 6 (MK1) 27.5 full suspension mountain bike frame with up to 24 months 0% finance and free delivery. Rider Height Guidance* 5'0" to 5'6" 5'4" to 5'7" 5'6" to 5'10" 5'9" to 6'1" 6'0" to 6'5"